The reading from the Holy Gospel today is Luke 11: 29 -33. At that time, when the people were gathered thick together, Jesus began to say, This is an evil generation: they seek a sign; and there shall no sign be given it, but the sign of Jonas the prophet. For as Jonas was a sign unto the Ninevites, so shall also the Son of man be to this generation. The queen of the south shall rise up in the judgment with the men of this generation, and condemn them: for she came from the utmost parts of the earth to hear the wisdom of Solomon; and, behold, a greater than Solomon is here. The men of Nineveh shall rise up in the judgment with this generation, and shall condemn it: for they repented at the preaching of Jonas; and, behold, a greater than Jonas is here. No man, when he hath lighted a candle, putteth it in a secret place, neither under a bushel, but on a candlestick, that they which come in may see the light. What is the sign of Jonas? 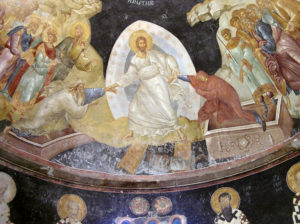 Christ Himself explains, in Matthew 12:40, “For as Jonas was three days and three nights in the whale’s belly; so shall the Son of man be three days and three nights in the heart of the earth.” The sign of Jonas is the Resurrection of Christ. 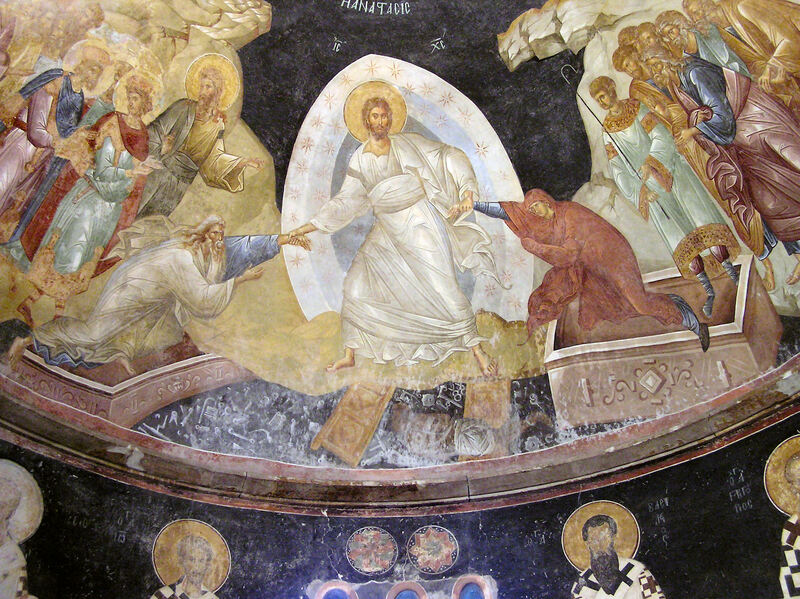 Just yesterday, Sunday, we celebrated the Resurrection once again, as we do week after week, Sunday after Sunday, and year after year, Pascha after Pascha. If only we understood more deeply what this means, if only we had a lively appreciation of the reality that the Resurrection is the foundation of our lives! Today people are fearful, but we have nothing to fear, for Christ has conquered sin, the devil, death, and hell. Today people worship nothingness – they are spinning out of control into suicidal darkness; they have made a pact with death. We worship Christ, the Life-giver and Light-giver. Rather than spinning out of control, we are centered and stable on Him. Today people are in despair, because they believe they have nothing to look forward to. We live in hope, for Christ having risen once will die no more – death has no power over Him. And our life, being hid with Christ in God, is indestructible – death has no power over us, but rather will be the gateway to an eternal and imperishable life. We all believe this, but we often – perhaps usually – do not feel it. We feel, instead, as do the sad inhabitants of this world who live outside the realm of grace, that we are slaves of “the system”- i.e., the society created by fallen man – oppressed by the grim necessity of purely material life. Of course, this is an illusion, for our baptism, our death and resurrection with the Lord, has freed us from all necessity, and we are truly free. We do not take advantage of our freedom, however, when we go on loving our sins and passions. Yesterday, we celebrated the Resurrection of Christ. Perhaps we even received His Body and Blood, the Fountain of Immortality. Yet even so soon as this morning, perhaps, or even yesterday after we left Church, we scattered the grace we received through distraction, and the working week now begins with gloom instead of joy. If only Orthodox Christians went forth to their work in this world shining with the light of Resurrection we receive on our beautiful Sundays! We would indeed become what Our Lord commands us to be: a light to the world. First and foremost, we should struggle to prepare more often for the great Mystery of Holy Communion. There are those who do not prepare but they go to Communion all the time – they are in great danger, committing the sin of audacity, and the priests who facilitate this are in even greater danger. They are in a kind of plani (deception), thinking like modern non-Orthodox people, with a make-believe “frequent communion” mode that is not much different from the mentality of the Vatican II “Catholics,” Episcopalians, etc. They think that just by going to Communion all the time they automatically have become like the early Christians, and yet they have some kind of unspoken “dispensation” to live the way that modern, worldly people do. On the other hand, there is the majority of us (I speak here of us “Old Calendarists” and other traditional Orthodox people), who respect the Holy Mystery the way our forefathers did. We know that the week before we commune, we must fast more strictly, not watch TV, not smoke, not go out with our friends, go to Vespers and have Holy Confession on the eve of communing, go to Church early and attend Matins, etc., but …we only prepare and commune once or twice a year! This is not as bad as the sacrilege of unprepared communion, but it still deprives us of the grace of true Christian life, and so, is the result really much different? Yes, we do not insult the grace, but we lose the grace. We are not like St. Mary of Egypt and other great ascetics, who could preserve the grace of their communion for a long time without regular sacramental communion. We need regular Holy Communion, because otherwise the demons get an open door and separate our inner lives and our family lives from Christ. We must face this. Let us all try to prepare and receive Holy Communion at least once every forty days. This would increase our reception of the Holy Mystery from once or twice to nine times per year, which would beautifully transfigure our family lives and our parish life in a marvelous way, not because of the “arithmetic” (“more is better”) but because our lives would become the way Orthodox lives should be, constantly vigilant; our souls would be in a constant state of struggle against the sins and passions, and our faces would be alight with the light of the Resurrection. We would truly live as the Body of Christ, receiving infinite power from the Body and Blood of Christ. To be what we should be, we must receive what we are. We must have His Blood flowing through our veins. 2. After we receive Holy Communion or the antidoron on Sundays, let us try to stay recollected and quiet. I know this is difficult, because in our circumstances, we usually see our fellow parishioners only on Sunday and feast days, and we naturally want to chat, catch up on their news, etc. We need this, because we don’t live in villages or ethnic neighborhoods any more, and we have to have the human connection. Even monks in hesychastic sketes converse on feast days and show a human interest in their brothers. But a. Let us keep our conversation on a high level, not gossiping and so forth, but saying that which encourages and edifies our brother, and b. When we go home, instead of TV or Internet, let us stay quiet and recollected, taking a walk outside in God’s creation, reading spiritual books or at least good secular books, doing quiet, “old fashioned” Sunday things with our family. Or, if we look at the Internet, we should find good Orthodox chants, sermons, or lectures (there are a lot out there! ), or healthy cultural and historical items, not the latest about politics or Hollywood scandals. 3. As we go to work on Monday morning, let us make an explicit prayer to Our Savior, that we not be consumed by the worries of this world, but maintain that which we have received on His Day. May the grace of the Resurrection shine forth in us!